She’s dubbed this series of hairstyles “heavy bangs hair”, and all of them come in a rich chocolate color that I think should work with most skintones. They’re named “pony”, “pop”, and “twin”, all of which coincides with the adorable lil’ pigtails that they sport in varying positions. As always, you can demo these for free at BP* and then pick them up for an affordable L$100 per style. The prolific Mimi Coral of ❤ Cupcakes sent her update group a notice this morning about her latest batch of tasty dresses, skirts, and a blouse. I happened to take a glance at the number of people in her group this morning and was surprised — when I first joined her update group about two weeks ago, there were only 18 people. Now there are 81! Her group is easy to join, just search for “<3 Cupcake” in the Groups tab and she should be about the fifth or sixth listing. What caught my eye this morning were the dress lengths. She’s been consistently releasing cute baby-doll type dresses with hems cut either at or above the knees for several weeks now, so the longer lengths of her new formal dresses are a nice change of pace. With the Floral Couture Formal dress, you get to show off your avi’s shoulders and back, which seems to be par for the course with the dresses at ❤ Cupcakes. Even with that fair amount of skin showing, the dress remains sweet and almost demure. Perhaps it’s the shape of the dress? The prim skirt starts slightly above the waistline and then falls nice and full around your legs. Or perhaps it’s because the dress is a lovely confection of satiny, almost pearlescent ruffles and gathers. ^_^ Either way, it works for me. ❤ Cupcakes is like a big candy store for me; whenever I go there, I can’t leave with just one item. Couple that with my indecisiveness, and you can see how I’ll easily lose twenty minutes in her store while contemplating all the pretty textures. 😀 Luckily for me, whenever Mimi releases an item in multiple colors she takes the pain of decision-making out of it — she simply packs all color versions of the item together and sells them as a single unit, as she’s done with her Leila Formal Gowns in pink, gold and blue. This time the prim skirt on this dress starts at the waistline instead of above it, and the bodice is just *packed* with details, making for a seemingly tactile texture. The skirt prims also possess this almost lifelike quality; as your avi walks about you can almost imagine hearing the material making rustling, crinkly sounds. If you’re the type that loves buying things in fatpacks, then you’ll want to take a look at these gowns. The dresses here usually sell for L$250 a pop; this set of three is going for only L$350. And speaking of getting great deals on multiple items being packed together, here are the Ruffly Polka Dot Skirts in silver, blue, gold, and pink. 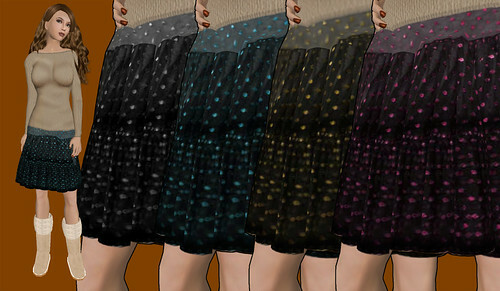 All four skirts will run you only L$150. If you’re anything like me and have collected far too many of the great boots that designers have been creating in SL, then you’ll apreciate the skirt length. With the hem cut just above the knees, these will go very nicely with a pair of flat-footed boots. Visit ❤ Cupcakes at http://slurl.com/secondlife/Optimal/103/224/23.